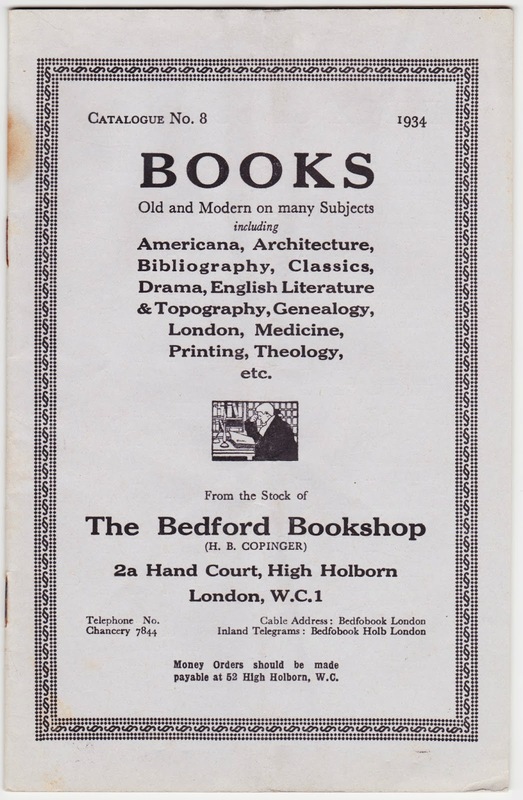 In 1934, The Bedford Bookshop of London — H.B. Copinger, proprietor — issued Catalogue No. 8 of its stock. The 44-page staplebound booklet is titled "Books Old and Modern on many Subjects including Americana, Architecture, Bibliography, Classic, Drama, English Literature & Topography, Genealogy, London, Medicine, Printing, Theology, etc." I thought it would be neat to take a look at some of the volumes and ephemera listed in this booklet, along with their prices then and now. Some Memories of the Civil War, together with an Appreciation of the Career and Character of Maj.-Gen. Israel Putnam, Leader in the Colonial Wars and in the American Revolution, by G.H. Putnam (New York, 1924).1 1934 price: 4 shillings. 2014 price: $18. Modern English Literature, its Blemishes and Defects, by H.H. Breen (Longman, 1857). 1934 price: 5 shillings, 6 pennies. 2014 price: Original edition unavailable on Amazon. Reprints are as low as about $15. An Inquiry into the Nature and Form of the Books of the Ancients; with a History of the Art of Bookbinding, by John A. Arnett (London, Groombridge, 1837). 1934 price: 15 shillings. 2014 price: $317. Struggles and Triumphs, or 60 years' Recollections, including golden Rules for Money-making, by P.T. Barnum (Buffalo, 1889). 1934 price: 6 shillings, 6 pennies. 2014 price: The original 1869 edition can be had for as low at $18, although I would exercise some caveat emptor if you're looking for a nice 19th century copy. The Great Pyramid: its History and Teachings. A Lecture, by T.S. Marks (London, Partridge, 1879). 1934 price: 5 shillings. 2014 price: Original edition unavailable on Amazon. Reprints start at $24. Intercepted Letters, or The Twopenny Post-Bag. To which are added Trifles Reprinted, by Thomas Brown, the younger (London, J. Carr, 1813). 1934 price: 6 shillings. 2014 price: $128. Northumberland: its History, its Features and its People, by the Rev. James Christie (1893). 1934 price: 4 shillings. 2014 price: $55. The Twilight of the White Races, by Maurice Muret (London, Unwin, 1926). 1934 price: 6 shillings. 2014 price: $63. A Letter from an Arabian Physician to a famous Professor in the University Hall in Saxony, concerning Mahomet's taking up Arms, his marrying of many Wives, his Keeping of Concubines, and his Paradise, (Paris, 1706). 1934 price: 12 shillings, 6 pennies. 2014 price: Paperback reprints start at $8. British Locomotives, their History, Construction, and Modern Development, by C.J.B. Cooke (London, Whittaker, 1893). 1934 price: 10 shillings. 2014 price: $46. 1. The booklet lists the publication date as 1824, but that must be a typo, given that it would predate the American Civil War.